Many tongues, but one heart. The Elven tongues are largely mutually intelligible- a Mesienic speaker will generally be able to understand Atorric and Cerzic as well. All three languages are also spoken in certain Southern Fiefdoms, based on regional influence. Dialects exist, but for the purposes of gameplay are also mutually intelligible (unless of course misunderstanding or total lack of comprehension is desired by the gamemaster). The Cerzi tongue also includes a greater-than-average amount of loan words from other cultures due to the Cerzi people's nomadic nature. Nurianic and Sharum are related to, but distinct from, modern elvic languages, as they share an early-elvic base. They have developed in different ways, and are not mutually intelligible. Sharum or Sharic has a notable degree of influence from Eastern Imperial, but they are not similar enough to be considered mutually intelligible. Eastern Imperial, or Kirylum, has its own roots, and aside from its influence on Shar, bears little to no resemblance to other languages of the Eastern Continent. Nurianic and Sharum are spoken mainly in the Southern Fiefdoms in areas of Nurian and Shar influence, respectively, but can also be heard in Atorra, the Eastern Empire (especially Sharum) and Mesia (especially Nurianic). Eastern Imperial is spoken mainly in the Eastern Empire, but can also be heard in eastern Atorra, and Empire-influenced lands in the Southern Fiefdoms. Druidic is known by very few. Those who are fluent are generally either the Druidi themselves and those that they trust very much. The Druidi are very secretive after past centuries of oppression, and a language that only they know is a great advantage for secrecy. A character cannot start the game knowing Druidic unless they themselves are a Druid, although they could feasibly learn it from a Druid in the course of a campaign. It should be emphasized that Druidic is only taught to very trusted outsiders. Due to their isolation, Anmaric is quite different from other languages and is not mutually intelligible with anything. It is also almost entirely useless. While highly useful in Anmar, and perhaps usable in certain areas (e.g. in Mesia, where the Anmari have mingled somewhat), it is not generally found anywhere else, nor used for trade or commerce. Even Anmari travelers generally learn other languages, such as Mesienic. A character born in Anmar will start with Anmaric by default. Any other character will begin unfamiliar with it, unless it is an explicit part of their backstory (for a level 1 character, unlikely). They can learn it in the course of the campaign, although finding a teacher may be difficult. Orkken are uncommon on the Eastern Continent, but there is a dominantly Orkkan state in the Southern Fiefdoms called Do'ngon. A character is unlikely to know Orkic unless they are from Do'ngon, or Orkken themselves. Merchants who trade with the Eastern Continent are also likely to know Oric. The Elvic symbol set is used throughout Elven lands and the Southern Fiefdoms, and with some differences between languages, is the native alphabet for Nurianic, Sharim, and all Elvic. It is also used by most for foreign languages such as Oric, Anmaric and Eastern Imperial, despite these languages having their own scripts. Literate native speakers of these foreign tongues will of course use their own writing at home, but for purposes of trade and communication, Elvic symbols are generally used in all public spaces. Elvic tends to spell foreign words phonetically, so a speaker of Elvic should be able to sound out other languages written in the Elvic alphabet with a reasonable degree of accuracy. It should be stressed that this is not reading- no comprehension will be gained just by making the sounds of letters! 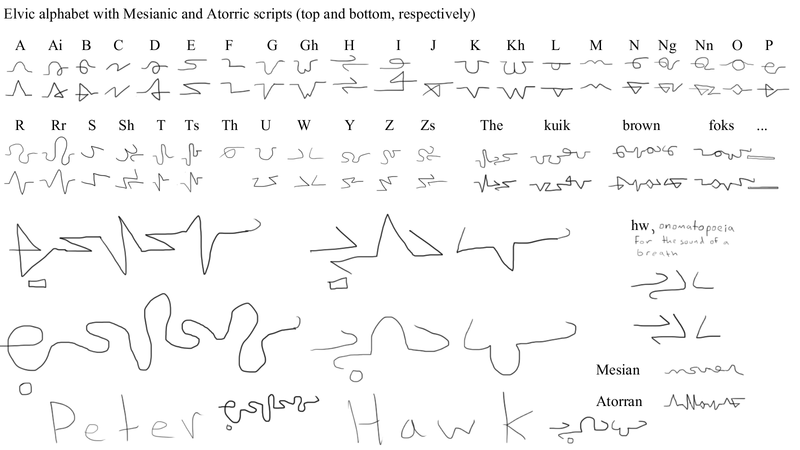 The Imperial language uses its own script, except when dealing with Elvic speakers.